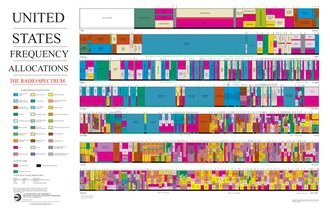 Frequency allocation (or spectrum allocation or spectrum management) is the allocation and regulation of the electromagnetic spectrum into radio frequency bands, which is normally done by governments in most countries. Because radio propagation does not stop at national boundaries, governments have sought to harmonise the allocation of RF bands and their standardization. The International Telecommunication Union defines frequency allocation as being of "a given frequency band for the purpose of its use by one or more terrestrial or space radiocommunication services or the radio astronomy service under specified conditions". exclusive or shared utilization, within the responsibility of national administrations. Allocations of military usage will be in accordance with the ITU Radio Regulations. In NATO countries, military mobile utilizations are made in accordance with the NATO Joint Civil/Military Frequency Agreement (NJFA). ^ Haim, Mazar (2008-08-01). An Analysis of Regulatory Frameworks for Wireless Communications, Societal Concerns and Risk: The Case of Radio Frequency (RF) Allocation and Licensing (PDF). Middlesex University. ^ ITU Radio Regulations, Section IV. Radio Stations and Systems – Article 1.16, definition: allocation (of a frequency band). ^ "EMC Design Guide for PCB, Ford EMC, 2003" (PDF).